When did Po's scooter start flying? I used to sit with my young daughter in the 1990's watching Teletubbies, she was really into it. Her favourite was Po. Yesterday I was watching with my toddler grandson and Po was on her scooter and flying with it! When did Po's scooter get this flying ability? (AFAI knew it was pushed slowly along the ground). It flies for the first time in the new series, episode 28 (Flying). 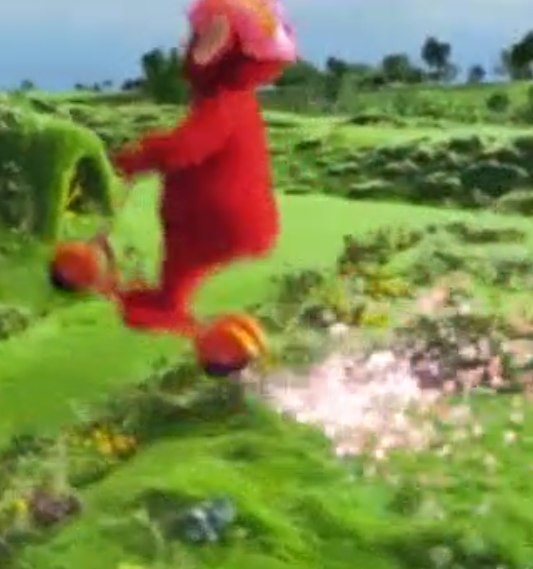 Narrator: One day, in Teletubbyland, Po was riding the scooter very fast. ... Tinky Winky, Dipsy and Laa-Laa thought that Po was going very fast. ... Po went faster and faster. ... Look at that! Po flew up into the sky. This article on the BBC website talks about the changes that have been made to the show, bringing it up-to-date for a new generation of hyperkinetic mobile-phone and tablet-obsessed children with even lower attention spans. Staying true to the original series Tinky Winky, Dipsy, Laa-Laa and Po retain their loveable, huggable distinctive features but have been subtly updated to cater for today’s pre-schoolers. The Teletubbies now have 21st century Touch Screen Tummies, which will broadcast beautiful live action films, shot from a child’s perspective. Some familiar characters will be back, including the Teletubbies’ hoover-like companion Noo-noo, and the series will feature many exciting new elements too: The Teletubbies’ new gadget, the Tubby Phone (voiced by Jane Horrocks), will bring the Teletubbies bang up to date with technology, and a twirling, whirling Tubby Custard Ride will provide the characters with endless custardy chaos and fun. Using pioneering technology, Teletubbyland and Home Hill have been visually enriched to create a magical environment for pre-schoolers to let their imaginations run wild. Intricate details such as stunning flowers, that viewers will see grow from buds into fully fledged blooms, will add bursts of glorious colour, and a new windmill, crafted from natural materials, is also part of the lush environment. Not the answer you're looking for? Browse other questions tagged teletubbies or ask your own question.